Marvellously modern mid-20th-century design is all the rage in a forthcoming sale from an Italian auction house. Isn’t it great when design meets function? Works of art can exist as practical pieces in your home. Italian auction house Cambi Casa d’aste is here to deliver: on 25 September, the theme of their auction is wonderfully rich works in the styles of the ‘40s, ‘50s and ‘60s. Exquisite modernism, seamlessly designed and expertly executed, is all the rage – and it’s not hard to see why. 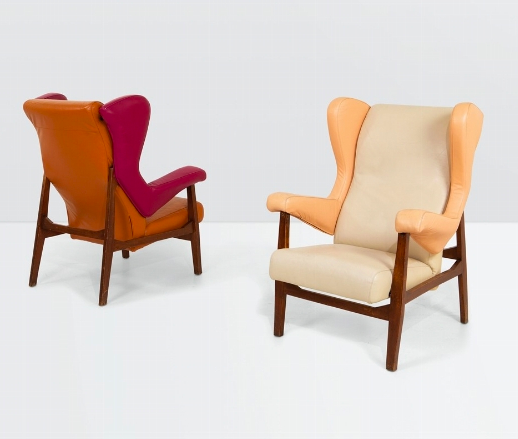 This pair of Franco Albini (1905-1977) Fiorenza armchairs, with wooden structures and leather upholstery, perfectly surmises the modern furniture in this sale. 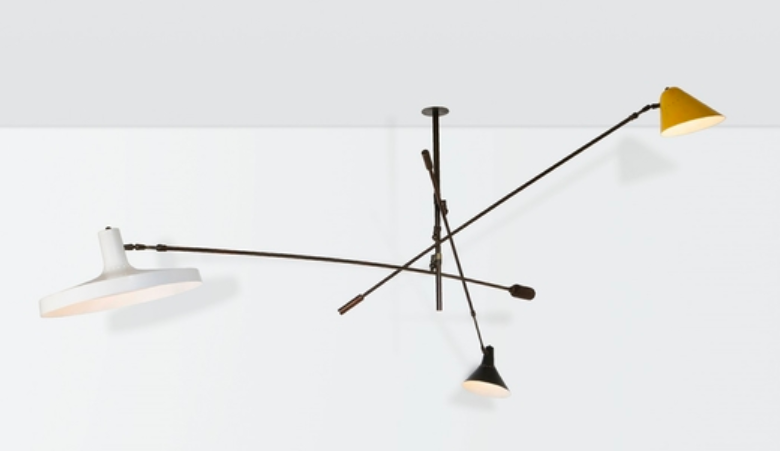 Here, Italian artisanship merges with new forms of modernism, and the result is a sleek design that is comfortable and practical. Albini first created his Fiorenza armchair in 1952 for Arflex, an Italian furniture company. 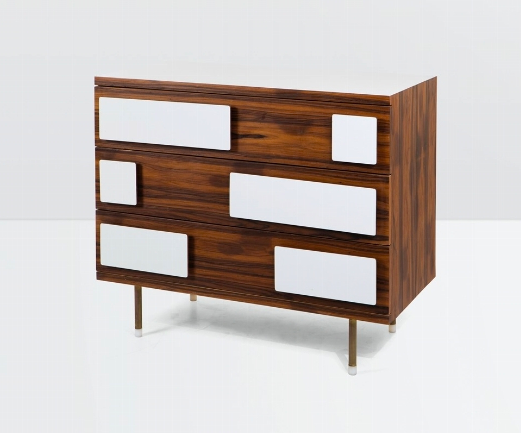 Giovanni ‘Gio’ Ponti (1891-1979) was an Italian architect, industrial designer, furniture designer, artist, teacher, writer and publisher with a career that spanned more than six decades. 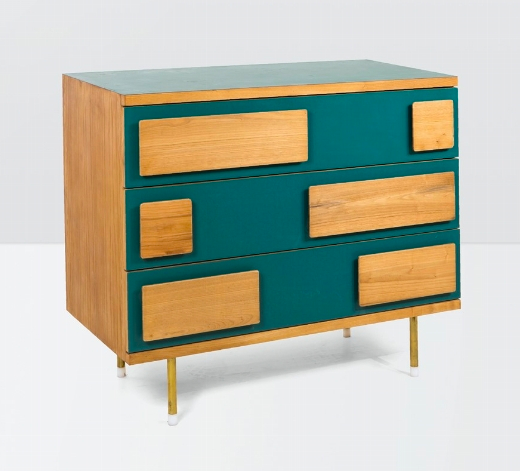 Throughout his steadfast career, Gio Ponti advocated the bond between craft and industry, as witness in his design of these wooden sideboards with pockets of laminated green wood (and white wood, featured above), also echoed on its top, and its brass stands. These pieces were originally designed for the furnishings of Hotel Parco dei Principi in Rome. This fabric upholstery and brass detailed sofa was designed in 1957 by Italian architect and designer Ignazio Gardella (1905-1999). 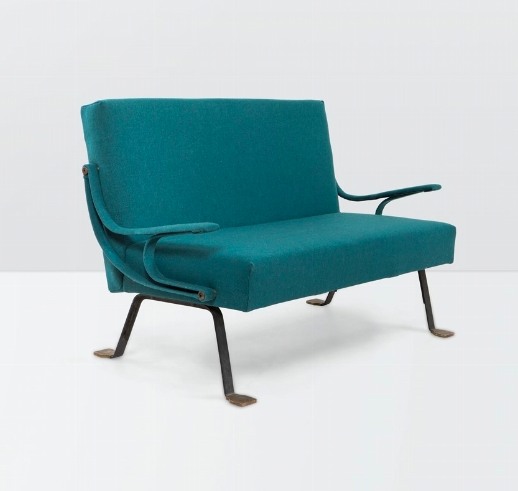 He was known for working with geometric lines and gentle curves, as echoed in this turquoise sofa. Its brass legs slowly curve out into feet, in the same manner that its arm rests and the ends of the squab curve around. The sales house says it is convinced of the need to offer more annual events, where key selections will be restricted, but much more targeted. The sale 'Design 200', which will take place on September 25 in Milan, will be a gold mine for all collectors, professionals and lovers of the style of the 1940s to 1960s, who seek quality above all else. According to the auction house, the limited number of lots (200), will allow buyers to focus on a suitable and balanced catalogue.